When I was writing Cooking With Pumpkin, the recipe that stressed me out the most was pumpkin pie. From making the crust to creating the perfect filling, I was obsessed with making the perfect pumpkin pie. After all, a pumpkin cookbook needs to nail the pumpkin pie. Thankfully this pie is stress-free. It has a buttery, graham cracker crust that’s fast, easy, and the crunchy crumbs are the perfect contrast to the creamy filling. Best of all, no traditional pie crust to make, roll out, or fuss with. Normally I’m not much of a crust person, but when it’s a graham cracker crust, look out. I loved this crust so much that I was asking my family if they were going to eat their crust because I wanted it. The filling is made with one of Breyers new 36 Gluten Free Varieties. They have four versions of vanilla – Natural, French, Extra Creamy, and Homemade. The Extra Creamy sounded good to me and it delivered. It’s definitely very creamy, smooth, and helped create a perfectly creamy pie filling. The filling is made with Breyers Gluten Free Extra Creamy Vanilla, pumpkin puree, and it’s nicely flavored with cinnamon and pumpkin pie spice. The pumpkin flavor really shines through. It’s like eating a giant Pac-Man a piece of frozen ice cream birthday cake but instead of cake, it’s pumpkin pie. A new one for me, but so good. And so easy. You can make it weeks in advance and keep it in the freezer since it’s ice cream after all. It’s a nice recipe to remember for Thanksgiving pumpkin pie-making because you can do it far in advance. The best kind of pie. This is the easiest and most stress-free pumpkin pie you’ll ever make. It has a buttery, graham cracker crust that’s fast, easy, and the crunchy crumbs are the perfect contrast to the creamy filling. Best of all, no traditional pie crust to make, roll out, or fuss with. 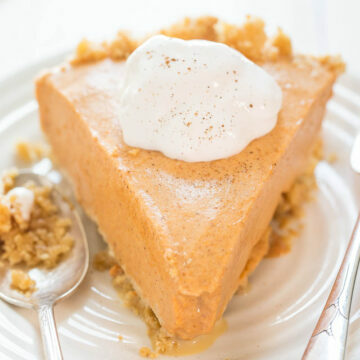 The filling is made with Breyers Gluten Free Extra Creamy Vanilla, pumpkin puree, and it’s nicely flavored with cinnamon and pumpkin pie spice. The pumpkin flavor really shines through. You can make the pie weeks in advance and keep it in the freezer since it’s ice cream, making it an easy make-ahead Thanksgiving pie recipe. Add the graham cracker crumbs, granulated sugar, and stir to combine. Turn mixture out into prepared pie dish, hard packing it with a spatula or your fingers, making sure to extend the mixture up around the sides. Bake for 10 minutes; set aside to cool. While pie cools, make the filling. To a large mixing bowl (same one used for the crust is okay, wipe it down with a paper towel) add the ice cream, pumpkin, brown sugar, vanilla, cinnamon, pumpkin pie spice, and beat with an electric mixer until smooth and combined. Pour filling into crust and place in the freezer to chill for at least 4+ hours (overnight is fine) or until set. Prior to slicing, you may with to place pie on counter for about 15 minutes so it’s not as firm. Optionally, top with whipped cream before serving. Pie will keep covered in the freezer for at least one month. The Best French Silk Pie – Homemade French Silk is the most amazing thing ever! You HAVE to make this! Beyond words how crazy good it is!! 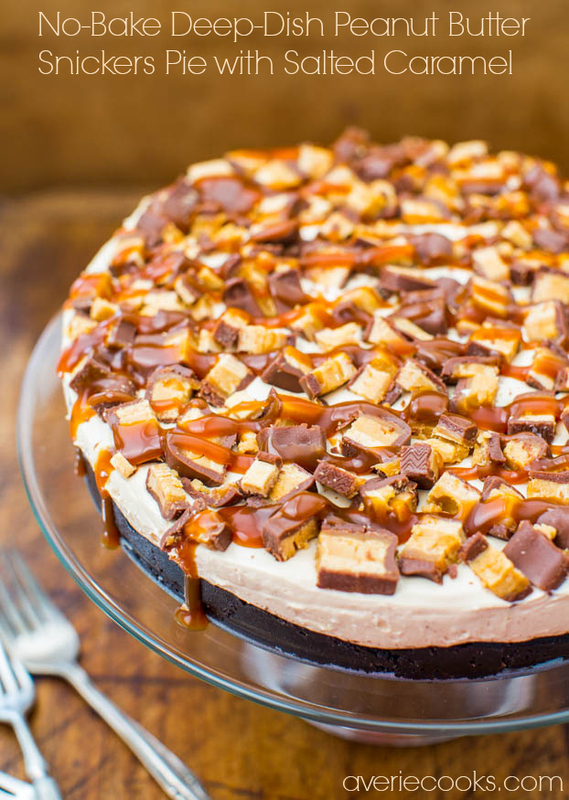 No-Bake Deep-Dish Peanut Butter Snickers Pie with Salted Caramel – An Oreo crust with a peanut butter filling and topped with Snickers and caramel! Pumpkin Chocolate Chip Bundt Cake with Chocolate Ganache – The softest, moistest and best pumpkin cake! Easy & everyone loves it! 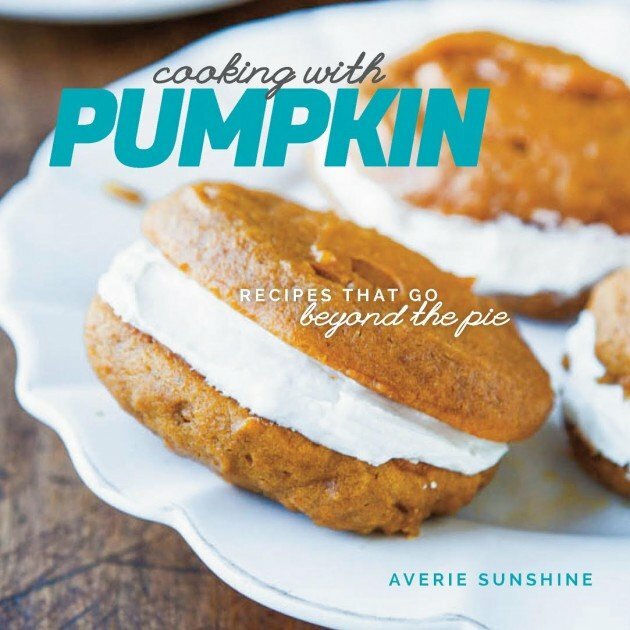 Cooking With Pumpkin: Recipes That Go Beyond the Pie is my second cookbook and the official release date is October 6. Post is brought to you by Breyers. Recipe, text, images, and opinions are my own. For nutritional information on Breyers original recipe, please visit their site. 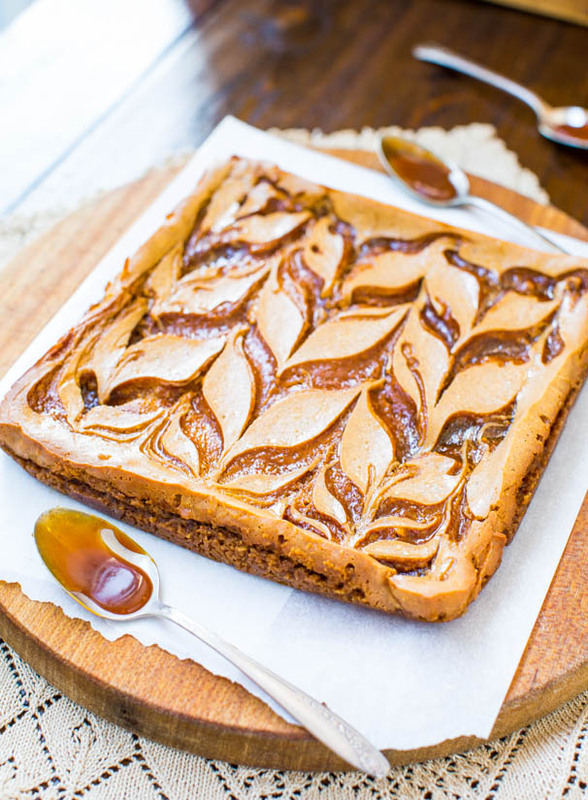 this is such a nice change from traditional pumpkin pie – love this! I remember the pie emails. I’m sure you nailed that like you did this one! I love ev.er.y.thing. about this recipe. What? Two of the best things in the world combined into one? This is brilliant. OH.MY.LAWD! My jaw is on the floor. This is insane, in the most delicious way possible!!! You can never go wrong with an ice cream pie! This looks so beautiful! Pumpkins are in season now and I think that adding them in the daily menu is a great idea. I used to prepare them in the oven adding honey, walnuts and cinnamon but your pie looks so delicious that I am going to change the habit. in the oven adding honey, walnuts and cinnamon = that sounds wonderful!! Averie, you are a genius! 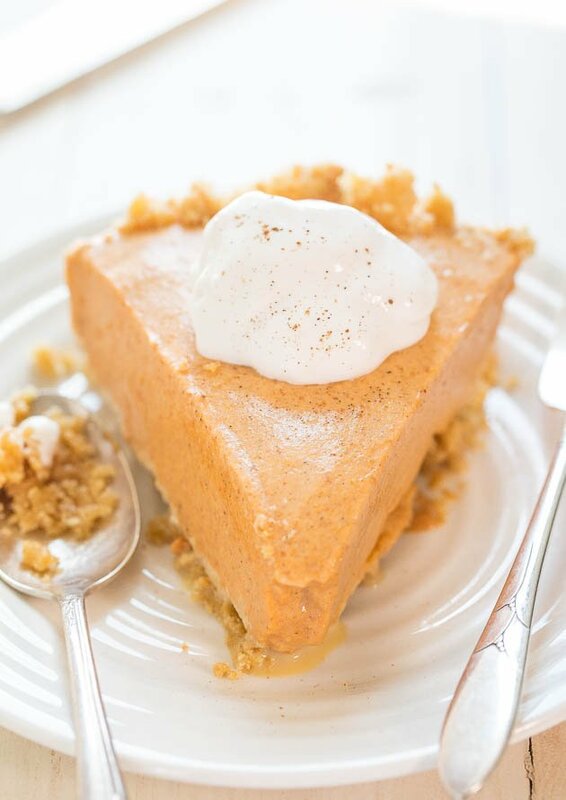 love this pumpkin ice cream pie!! can’t wait to get your new book! 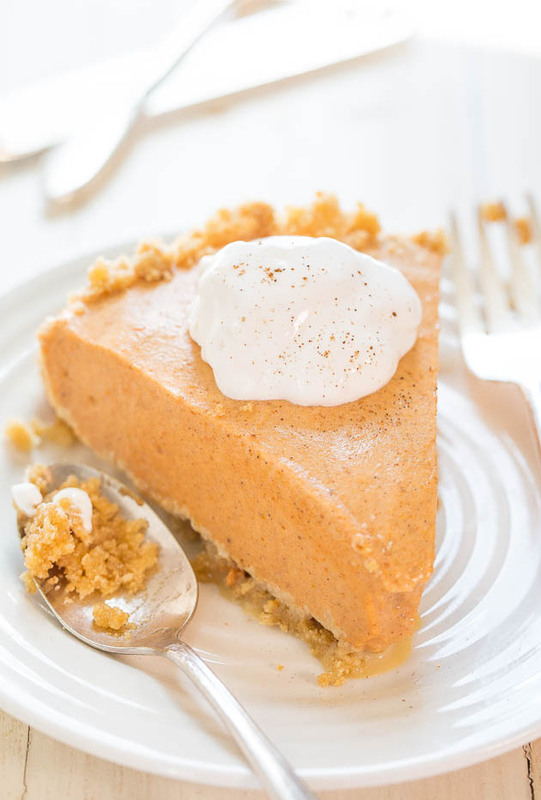 This pumpkin pie looks delicious and sounds simple to make! I think I will try it this weekend! I always eat my pumpkin pie w/ ice cream instead of whipped cream and now it’s the best of both worlds!!!!!!! You know the absolute fastest way to a girl’s heart is ice cream, don’t you? I melted when I saw this post come up in my feed. Absolutely stunning–a great power combo, girl! Really stunning Averie— love that color! Amazing recipe. Made this Thurs night and it was divine. Thank you as always!!!!!! I added cinnamon to the crust because it’s my crack and also used a few oreo crumbs since I ran out of graham crumbs. It turned out amazing. I also made a caramel maple cinnamon glaze to drizzle on top. I can see why you go crazy over the crust.. I think it’s the best part!! mmmmm. Lovin all your pumpkin recipes! HAHA there’s no other way to be!!! :D MMMMMMM..ok deal..will try the glaze. It looks pretty damn heavenly. I love hearing all of these stories about when you were working on your pumpkin cookbook. It’s so fun to hear about life behind the scenes, especially when juggling both a blog and cookbook. I’m so impressed that you did it twice in a row — it’s hard enough just pumping (umm I actually typed “pumpkin” first… can you tell what’s on my mind?) out enough quality content for a blog! 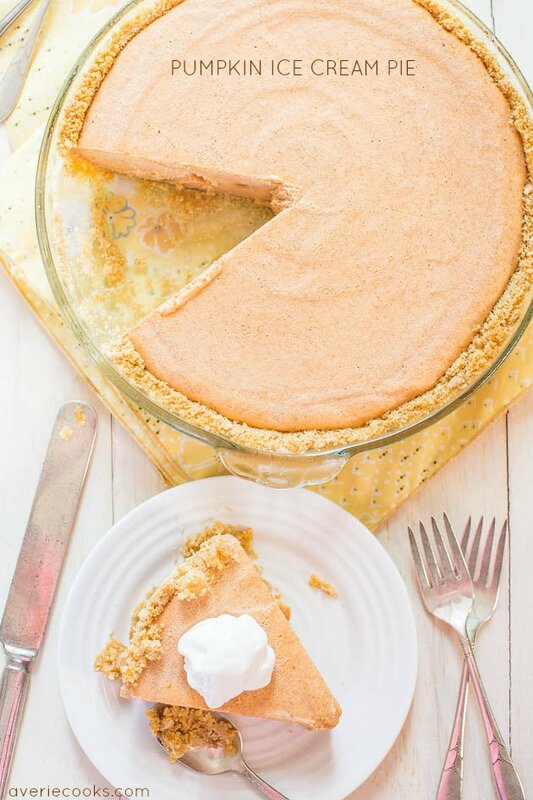 Love the simplicity of the ice cream pie filling, and ohmygosh don’t even get me started on graham cracker crusts… I’d gladly take those over regular ones any day! Pinned! Thanks for pinning and looking back on the blog/book, twice. In 24 months. Yeah, it was an insanely hellish pace, never to be repeated. Right now, I couldn’t even imagine another book :) I have trouble just finding time to respond to my comments! You do such an awesome job responding to all of the comments Averie! It really shows how much you care about your readers and community. You’re the best! I am on such a pumpkin kick and the best part is my boyfriend hates pumpkin… more for me! Can’t wait to try this recipe. Thanks! On one of the first Thanksgivings that I took over cooking some of the components, pumpkin pie scared me the most, too. So I opted with an easier version: pumpkin pudding pie, which tasted AMAZING, was no-bake, and was so easy. This reminds me fondly of that pie, except with ice cream which exponentially makes it cooler, figuratively and literally! pumpkin pudding pie, which tasted AMAZING, was no-bake, and was so easy = POST THAT this year! That’ll be a hit! It sounds amazing!!! I want some! This is probably a silly question but… could this be made with regular (not gluten free) ice cream? Thanks– looks wonderful. Yes absolutely you can make it with regular ice cream. Enjoy! Could you use lactose free ice cream as well. My daughter is lactose intolerant but she loves anything pumpkin. Looks great and I can’t wait to try it. I’m sure that would be fine although I haven’t played around with it personally. I made this pie over Thanksgiving and it was a huge hit! I plan on making it for Christmas as well. Thanks so much for sharing this wonderful recipe. It’s a great spin on a classic pie and it incorporates something most people love: ice cream! I shared this with my readers and hopefully they’ll love it as much as I did.